The Vector Vicair X Cushion is a lightweight, stable, adjustable and maintenance free all in one air cushion. The fully adjustable compartments of the Vector Vicair Cushion provide each individual a custom fit with maintenence free air cells. The Comfort Company Vector Vicair X Cushion features tapered leg abductors and adjustable leg troughs to promote proper leg alignment, as well as elevated side compartments running from front to back to provide lateral support for the pelvis and thighs. The rear middle compartment of the Vector Vicair X Cushion allows deep immersion, keeping the user from sliding forward in the air cushion. Air cells may be added or removed from all 6 fully adjustable compartments of the Vector Vicair Cushion for a custom fit. The Comfort Company Vector Vicair X Cushion comes standard with incontinent proof lining and a non-skid bottom. The Comfort Company Vicair Cushion includes your choice of either the Stretch-Air fabric cover or the Comfort-Tek cover. The Stretch-Air cover is designed for air transmission and heat reduction. This two ply, breathable laminate cover combines a high stretch lycra top layer with a layer of reticulating foam and waterproof, breathable vapor barrier. 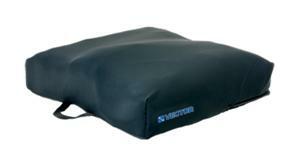 The Comfort-Tek cover is engineered for pressure relief and comfort. The Comfort-Tek cover's multi-dimensional stretch alleviates pressure on bony prominences. The Comfort-Tek cover is fluid proof and can easily be cleaned with detergent. The Comfort Company Vicair Cushion features the award winning Vicair air cells that adapt to body contours due to the free movement of the cells. Individual cell deformation allows the Vicair Cushion to provide secondary adaptation to minor body contours. The Comfort Company offers a wide variety of seating and positioning products designed for all wheelchair users, featuring hundreds of product options to fit any user's needs. The Comfort Company guarantees all of its products for life against manufacturer defects. The Comfort Company will gladly repair or replace any of their products at no cost to you. Tapered leg adductors and adjustable leg troughs promote proper leg alignment. Fully adjustable compartments provide custom fit with maintenance free Air Cells. Rear middle compartment allows deep immersion, keeping the user from sliding forward. Air Cells may be added or removed from medial thigh separator to stabilize user. Elevated side compartments running front to back provide lateral support for pelvis and thighs. Vicair Cushion is a stable, maintenance free, adjustable air cushion. 6 compartments, all adjustable for a custom fit. Air cushion weighs only 2.5 lbs. All sizes come standard with incontinent proof lining. Non-skid bottom with four loop patches and matching adhesive hooks. The Vector Vicair Cushion has a weight capacity of 550 lbs. Lifetime manufacturer warranty from the Comfort Company. VT1010 10" x 10" 3.5" 3" 4.5" 2.5 lbs. 550 lbs. VT1212 12" x 12" 3.5" 3" 4.5" 2.5 lbs. 550 lbs. VT1414 14" x 14" 3.5" 3" 4.5" 2.5 lbs. 550 lbs. VT1416 14" x 16" 3.5" 3" 4.5" 2.5 lbs. 550 lbs. VT1516 15" x 16" 3.5" 3" 4.5" 2.5 lbs. 550 lbs. VT1616 16" x 16" 3.5" 3" 4.5" 2.5 lbs. 550 lbs. VT1618 16" x 18" 3.5" 3" 4.5" 2.5 lbs. 550 lbs. VT1620 16" x 20" 3.5" 3" 4.5" 2.5 lbs. 550 lbs. VT1816 18" x 16" 3.5" 3" 4.5" 2.5 lbs. 550 lbs. VT1818 18" x 18" 3.5" 3" 4.5" 2.5 lbs. 550 lbs. VT1820 18" x 20" 3.5" 3" 4.5" 2.5 lbs. 550 lbs. VT2016 20" x 16" 3.5" 3" 4.5" 2.5 lbs. 550 lbs. VT2018 20" x 18" 3.5" 3" 4.5" 2.5 lbs. 550 lbs. VT2020 20" x 20" 3.5" 3" 4.5" 2.5 lbs. 550 lbs. VT2216 22" x 16" 3.5" 3" 4.5" 2.5 lbs. 550 lbs. VT2218 22" x 18" 3.5" 3" 4.5" 2.5 lbs. 550 lbs. VT2220 22" x 20" 3.5" 3" 4.5" 2.5 lbs. 550 lbs. VT2416 24" x 16" 3.5" 3" 4.5" 2.5 lbs. 550 lbs. VT2418 24" x 18" 3.5" 3" 4.5" 2.5 lbs. 550 lbs. VT2420 24" x 20" 3.5" 3" 4.5" 2.5 lbs. 550 lbs.